Magnolia grandiflora growing tree of the genus also known as Southern magnolia or Bull bay, Magnolia grandiflora perennial evergreen used as fragrant ornamental plant can grow in subtropics, mediterranean, temperate or tropics climate and growing in hardiness zone 6-10. 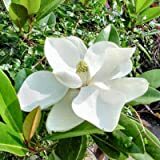 Magnolia grandiflora LITTLE GEM SOUTHERN MAGNOLIA Seeds! Magnolia grandiflora hardy form EVERGREEN, Fragrant Flowers! 1 Plant!